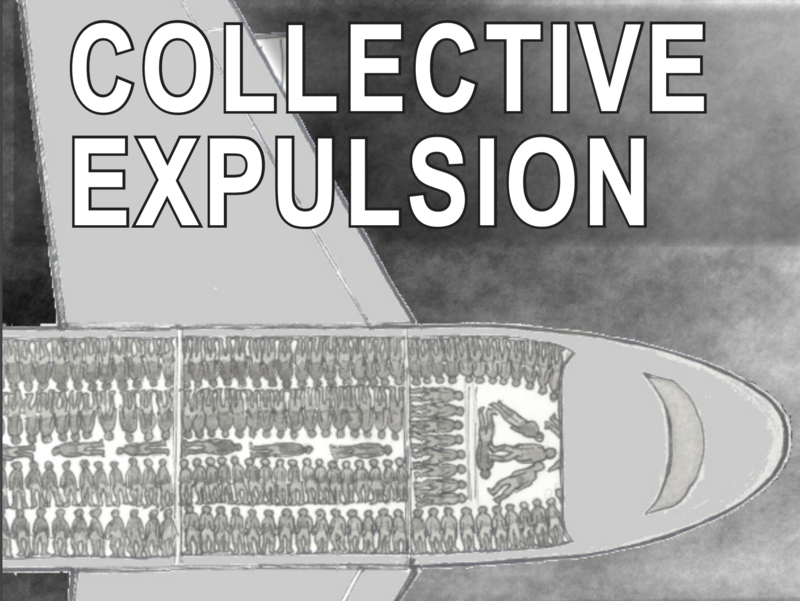 Following on from their brilliant 2013 report, “Collective Expulsion: the case against mass deportation charter flights”, Corporate Watch have produced a new factsheet to provide updating information on the mass deportations carried out by the UK government. The factsheet covers an overall snapshot of deportations; the basics of charter flights; what charter flights are for and how they work. The factsheet then goes on to outline private companies’ involvement in the process, with information about the “muscle” (Tascor/Capita), the “fixer” (Carlson Wagonlit Travel) and the “supplier” (Titan Airways). Charter flight routes are agreed between the UK and other states at the highest political and diplomatic levels. For example, the first in the new wave of charters to Pakistan took place in November 2011, not long after a visit by then prime minister David Cameron to negotiate a new “Enhanced Strategic Dialogue”, which included an objective of increasing bilateral trade to £2.5 billion per year as well as a £650 million “education aid” programme. The flight itself took place on the same day of a visit to Pakistan by then home secretary Teresa May. The first flight to Ghana took place in the same month, just a few weeks after a visit by then Immigration Minister Damian Green. (See Corporate Watch: Collective Expulsion p19). For the main destinations – Pakistan, Kosovo/Albania, Afghanistan, and Nigeria / Ghana – flights appear to be scheduled at more or less regular intervals. E.g., for some years, Afghan migrants and their friends knew to expect a fortnightly or monthly charter to Kabul – with arrests made to fill up the numbers. Almost all charter flights take place on a Tuesday or Thursday, and are generally spaced so that there is at most one a week. In 2014 and 2015, there was usually a monthly flight to Kosovo / Albania, and sometimes two in one month. Through much of 2014 these flights were generally on Fridays, but then switched to Thursday as the regular day. In 2015, there was a flight to Nigeria and Ghana at the end of every other month (in January, March, May, July, September, November). They were always on a Tuesday, either eight or nine weeks apart. Flights to Afghanistan became much less regular over this period, and there were only three in 2015. Still, they were always on Tuesdays. Getting people onto these flights is part of the job of the Home Office’s “Immigration Enforcement” division. This division was set up in 2012/13 when the Home Office split the functions of the former UK Border Agency (UKBA), and it is in charge of all “enforcement” roles within the territory as opposed to at the frontiers: i.e., raids, detention, and deportation. In July 2013, the Home Office set up a central unit called “National Removals Command” (NRC) within the Immigration Enforcement division. This unit, based in Croydon’s Lunar House, is in charge of arranging detention and deportation of “illegals”, as well as running the “assisted voluntary return” scheme. To do this it liaises with the Immigration Control and Enforcement (ICE) teams who carry out raids and arrests on the ground. The official procedure is basically as follows. First, “illegal migrants” are picked up in ICE raids (e.g., dawn raids on homes, workplace raids, raids on “sham marriages”, etc. ), or when reporting at a signing centre, or perhaps by the police. The arrest team contacts NRC, who give the order whether or not the person should be detained. Once in detention, NRC decides how and when to deport the detainee, including whether they should be put on a charter flight. ICE teams may have standing instructions to find and arrest quotas of migrants from the regular “charter nationalities”, i.e., at the present time, Pakistanis, Albanians, Nigerians and Ghanaians. Home Office statistics show that these nationalities are particularly hit by deportations – although it is hard to show whether the existence of regular charter routes is a cause or a result (or both?) of this. If a specific less regular charter flight is planned, e.g., the recent flight to Jamaica, ICE teams may be given specific instructions to round up people of these nationalities in the weeks running up to the flight. There is plenty of anecdotal evidence of this pattern. Why does the UK government use charter flights to enact mass deportations? The fact sheet lays out the motivations for this policy: meeting targets, stifling rebellion, as a so-called “deterrent”, and as a foreign policy tool. The UK began using charter deportations in 2001. From the beginning, they have targeted a handful of countries, mainly those symbolically identified with the “refugee crisis”, and with the UK’s war machine. The first flights were to Kosovo and Albania. Romania and the Czech Republic soon followed, with Roma people the main targets of these deportations. In 2003 charters began to Afghanistan, newly declared “safe”. For the next nine years, the majority of flights were to Kosovo / Albania and Afghanistan. More recently, Pakistan has taken over as the UK government’s main charter “partner”, after a landmark deal was struck with the Pakistani government in 2011, as part of a larger trade and aid negotiation. African countries have also now became regular destinations, notably Nigeria, Ghana and (until recently) the Democratic Republic of Congo. September 2016 also saw a charter flight to Jamaica, the first since 2014. Flights have ceased, at least for the meantime, to Iraq and Sri Lanka, after successful political and legal campaigns involving refugee movements from these countries. In the case of Iraq, organised opposition in the destination country was a major factor, which led to the Iraqi parliament and Iraqi Kurdish authorities refusing to accept deportees. Flights to Afghanistan have also stopped for the moment, but they continue from other European countries, and many fear they will also soon resume from the UK. The 2013 Corporate Watch report made a strong case for the policy in itself being unlawful. Individuals seeking to halt their removal/deportation by charter flight will normally need an injunction to do so. This is difficult to achieve without legal representation.